The TAIKO DRUMMERS present exciting pieces, which incorporate dynamic and fluid movement that visually accent their heart pounding percussion. Their repertoire includes traditional pieces, which were taught to them by the world-renowned professional groups Kodo and Ondekoza from Japan. Their original compositions are infused with contemporary rhythms from their love of jazz and world music. They perform on traditional Japanese instruments such as odaiko (30" diameter large drum), chudaiko (19-22' diameter medium drum), shimedaiko (snare sized, rope-tied drum) and shinobue (bamboo flute) along with Japanese percussion instruments such as kane (brass gong), chappa (hand cymbals) and hyotan (gourd shaker). 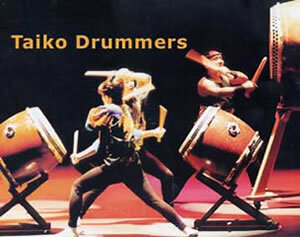 TaikoDrummers from Talent Screening Room on Vimeo.